Marc is one of a pair of nearly identical statues by Robert Llimós portraying a colourful, genderless, neo-expressionist human figure holding a large picture frame which it is looking through. The sculpture was inaugurated in 1997 and it’s title is a play on words. 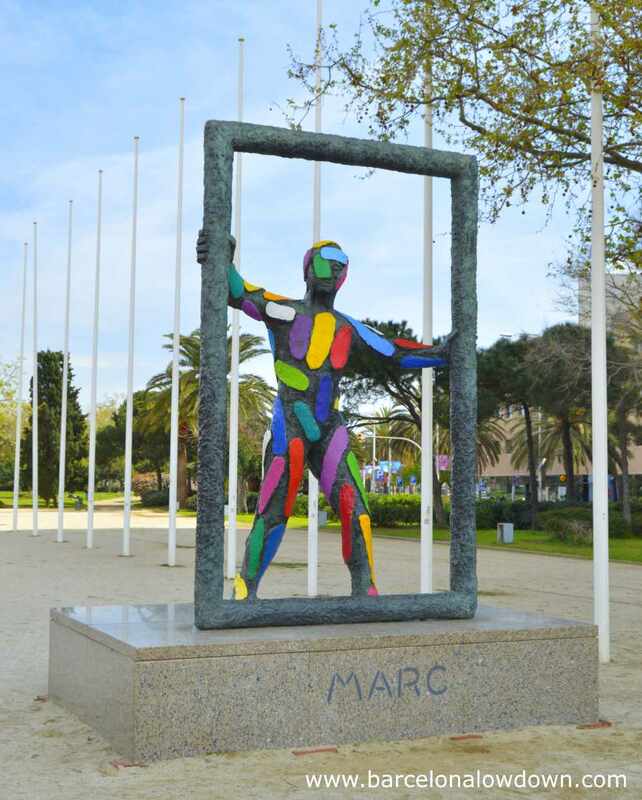 Marc means frame in Catalan and the statue is dedicated to the artist’s son Marc Llimós who died in 1995. The sculpture’s emblematic location in the Plaça dels Voluntaris adds an extra dimension to Llimós’ design. When viewed from the front your attention is drawn to the colourful bronze figure. As you circle round behind the statue your focus naturally shifts to the city of Barcelona itself. 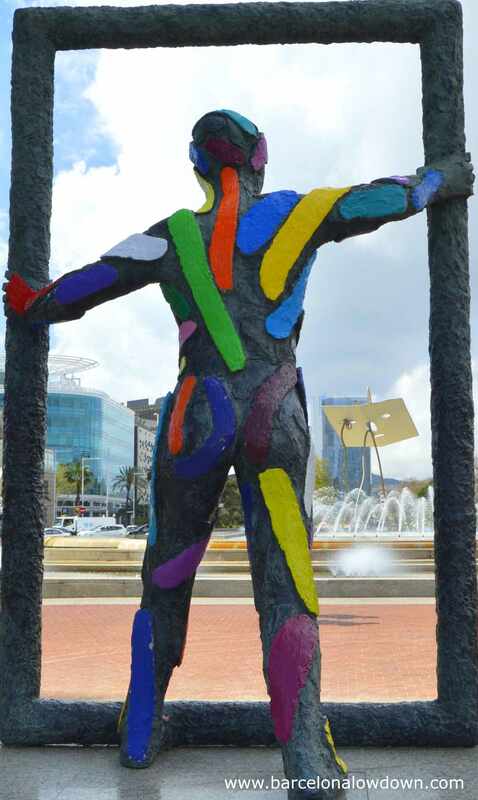 Marc’s counterpart is called Threshold and was installed in Atlanta (USA) when the city hosted the Olympic Games in 1996 as an artistic link to the previous olympic host, Barcelona. Robert Llimós is a Catalan painter and sculptor who was born in Barcelona in 1943 and studied art at the Escola Massana and L’Escola de la Llotja. Llimós is best known for his figurative works including Marc and Stargazer both of which are on display in Barcelona. Stargazer (Catalan: Miraestels) is located next to the Rambla del Mar in Barcelona’s Port Vell, there is another copy of the statue in Sitges. In 2009 while in Brazil for a wedding, Llimós was walking through the dunes near Fortaleza when he saw a UFO. The experience inspired a series of 150 paintings and sculptures depicting the spaceship and it’s crew. 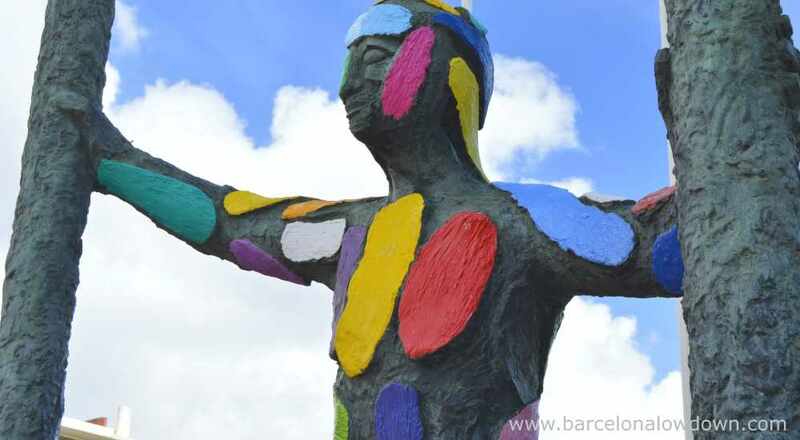 The statue is located in the Plaça dels Voluntaris next to the Torre Mapfre near the Port Olímpic on Barcelona seafront. This entry was posted in Attractions, Public Art tagged art, sculpture, Vila Olímpica and updated on September 24, 2017 by Richard.